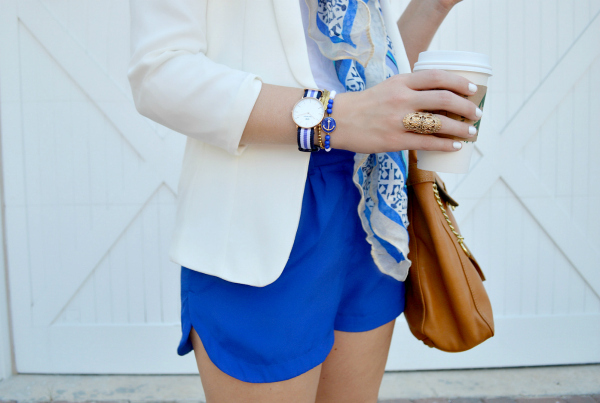 Perfect shorts and scarf! Girl, you have such a great style! Love all the blues. You look gorg. It's very cute this outfit! those blue details are wonderful! So pretty! I really love this outfit and all the items a part of it! You look fabulous! Happy Monday! Great outfit! Styled to perfection! I'm a Texas girl so I can wear a style like this for another month or so! I need to plan a trip to Texas asap. Then again, I say this every year when Dallas Cowboy Cheerleaders starts to air. lol. Love the shorts, so adorable!! This is so cute!! Love the shorts and the scarf! Love that scarf! Can't believe it's Old Navy! Darling pumps, Anna! Love how you pull all the blue tones together! Absolutely love this look. This color blue looks amazing on you. Obsessed! Blue is most definitely your color and you look incredible. I am a little obsessed with that first photo because you look so chic and fierce! I'm really loving all the shades of blue and those shorts & scarf are just so drool worthy! I almost bought those shoes the other day...love them with this look!! Beautiful job styling your look. You look amazing! Those heels were made for a pair of shorts like you have on! What a fun casual but ocean inspired outfit, looking beautiful as always. really loving the cut of that blazer. so flattering! I love how your scarf matches your shorts! Lovely shoes. 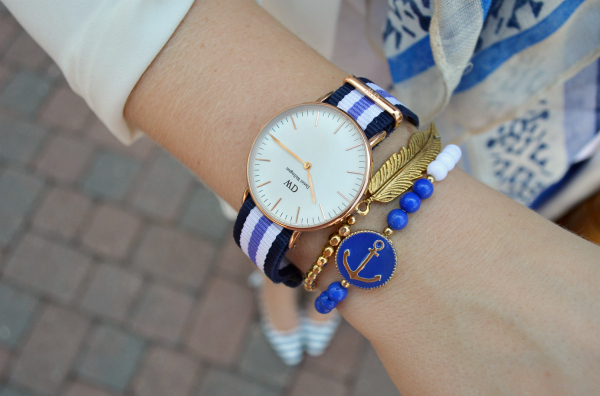 Your arm party is adorable. I absolutely love this look! Wish I had it in my closet too! 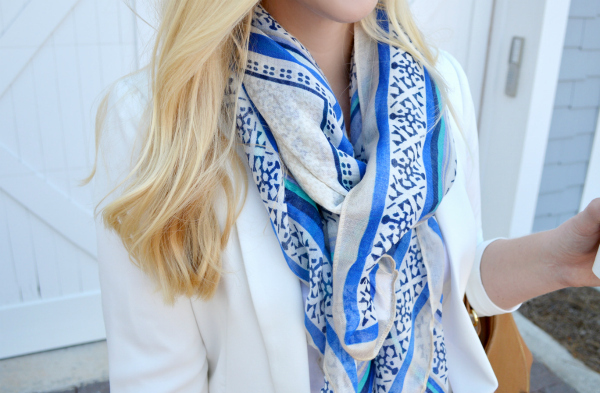 very pretty, love the scarf! Love all the blue. I also love the striped shoes! The scarf is so pretty as well. I wanna see the black of these shoes. The bow looks presh. Wow, you really have some great legs! :) Loving your outfit btw. Love the sophisticated feel of the outfit! Great scarf! That print makes me think of all the tiling at the Alhambra in Granada, Spain. Wow I love this beautiful outfit. I always love wearing blue. You can see that also on my latest outfit post where I`m wearing a cobalt blue Ted Baker dress. Love this outfit. The blue is gorgeous on you. Love everything about this outfit!! Those shorts are so flattering and the fit is just perfect! This navy look is so nice! Stunning as always! Love the scarf a lot! Love that color on you! So pretty! I absolutely love this look! Blue is one of my favorite colors. And it definitely suits you! really great styling,cool and stylish fall look! Very cute look. Thanks so much for checking out my blog! Absolutely in love with this all blue look! You look gorgeous! love this outfit. very sophisticated. love that blue! so bright and pretty! it really stands out! That electric blue colour is TO DIE FOR!